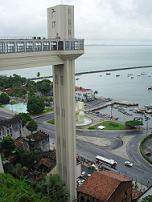 A city of rich folklore, Salvador has maintained an ambience of archaic mystery that lures in many a marveling visitor. The state of Bahia has kept a firm grip on its strong African, Brazilian, and European roots it has acquired throughout 500 years of existence. It is with such African and indigenous background that Salvador is provided with the authentic, mythical appeal it holds today. Through its ability to successfully balance tradition with modernity, Salvador has been able to produce some of the richest Brazilian art forms: capoeira, samba de roda, and afoxe- an African rhythm that influenced many Carnaval groups. The city has been crowned "the land of happiness," and not without reason. Thirty miles of georgeous beach area and an immeasurable amount of smiling, laughing, and partying radiate from the city. 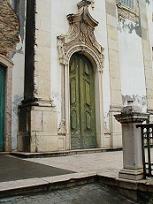 Salvador was the first capital of Brazil, and is currently the capital of the state of Bahia. Amerigo Vespucci - the same man who discovered America -arrived here on November 1st, 1501, sailing under the Portuguese flag., With November 1st being the day of all saints, Vespucci decided to name his ground of arrival the Bay of All Saints. The Portuguese crown soon came to profit immensely from the "white gold" that thrived in the Northeast: sugar. Salvador became the center of the immense slave market that provided the labor demanded to upkeep the sugar cane field plantations. The 5 million West African slaves that arrived at the edges of the city provided much more then just labor, however: they helped form an integral part of the culture that is now known as Bahian. The African Candomble religion has its strongest roots and its active followers here. Bahian cuisine is known for its distinct and delicious flavor that emerged from the use of such African cooking products as dende oil and coconut milk. Salvador actually ended up dividing into two planes of existence as a result of its topography. As it sits on the Bay of All Saints, the city becomes a series of hills and valleys; The upper city, Cidade Alta, and lower city, Cidade Baixa, are connected through the famous Elevador Lacerda. Before this elevator, the only connection between the "two cities" were steep and jagged small streets. The main neighborhoods tend to sit on top of the heights, providing magnificent views. While at sea level, a wide variety of Brazilian arts and crafts can be found at the Mercado Modelo Market, along with traditional Bahian acarajes and sweets being served by the Baiana women in traditional white. Lodging options are divided by area as well: the Barra district along the coast offers new, hip luxury hotels, while Pelourinho holds the more antiquated hotels and pousadas, with wooden interiors and decorated facades. Pelourinho (Pelo, by the locals) is the historic, colonial area that has been nominated a UNESCO World Heritage site for its large collection of Baroque colonial architecture - the largest in Latin America. Restored in the early 1990's, Pelo has become a famous attraction for visitors and locals alike, with its history, beauty, famous Baroque churches, and a thriving nightlife that divides itself between the many restaurants, bars, clubs and music venues. Due to the dips and turns of the city streets, first-time visitors can easily become confused as streets end abruptly and often change names seemingly without warning. 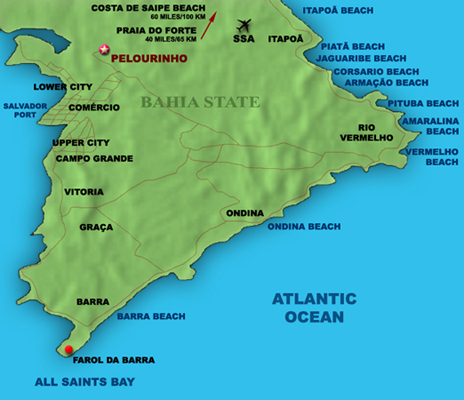 Good maps of Salvador are available at the Bahiatursa Tourist Office in Pelourinho. Many tours of the city are offered as well, of the historic Pelourinho, important museums, the history of Capoeira and practices, and many more! These will help you penetrate the Salvador and the Bahian culture much more deeply. And last, though definitely not least, there is the magnificent Carnaval in Salvador. This celebration has become quite the sensation, as well as a competitor to the original in Rio. The essential difference between the two is in Salvador, everyone participates. Salvador's Carnival has people dancing and singing right alongside the many parading blocos, while in Rio the activities are more observational. There are also many distinctly Salvadorian festivals held throughout the year, helping to form the opinion that in Bahia, even the smallest religious ceremony can be turned into a day-and-night-long celebration! Which, with the food and the laughter and the merriment, isn't anything to complain about.